In the previous post on this topic, I showed the Southern Pacific Common Standard drawings for track car set-outs or, as SP termed them, turnouts. 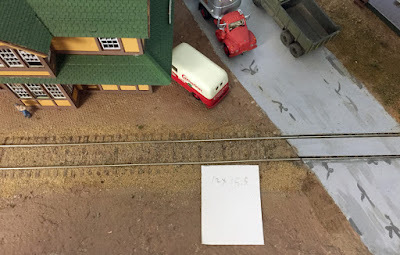 These were found all over the railroad (the previous post included a drawing note that these were to be placed about “two per mile”) and are one of those classic prototype items that are “often seen, seldom modeled.” You can read my previous post at this link: https://modelingthesp.blogspot.com/2018/12/track-car-turnouts.html . 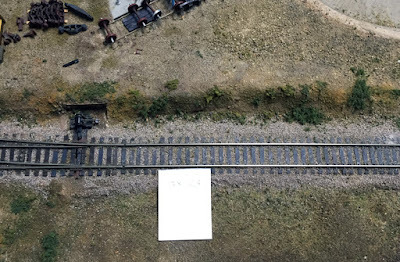 To begin the modeling part of this story, I needed to find places on the existing layout where these turnouts would both fit the space, and be logical locations. Turnouts were often placed near bridges, tunnels, or long cuts, places where a track crew might need to get off the track with a train approaching, as well as commonly near road crossings. At a road crossing, a crew could pick up or drop off equipment or supplies with a highway vehicle. I simply made a cardstock rectangle, roughly 12 x 15.5 scale feet in size, to match the dimensions of the standard turnout outside of the rails, as shown in the previous post (link in previous paragraph) in drawing CS 551. For example, I looked at the crossing of Willow Creek Road in my layout town of Santa Rosalia, also near the town depot. The card rectangle shows that there is space here to build a turnout. Another example is in Shumala on my layout, also near a road crossing. Again, there is clearly room for a turnout, and it would add some detail in an area otherwise represented as open ground. Lastly, I have a tunnel on the main line of the Coast Route, near Shumala, and this is one of the logical locations for turnouts. There is a section house near the tunnel, and a track car turnout seems a logical addition. The way I built these track car turnout panels was to start with a styrene rectangle, the same size as the card rectangle I showed in the photos above. Then I laid out the arrangement shown in CS 551 (a drawing included in the prior post; see the link given in the top paragraph of the present post). This resulted in something like the photo below. On the left is the layout I used, first making a center line, then laying out the distance to the sides where the “runner” ties are centered, and a limit at the end. The latter isn’t really needed, because I just added one and a half ties on each side (as the CS 551 drawing implies), then capped it with a full tie across the end. 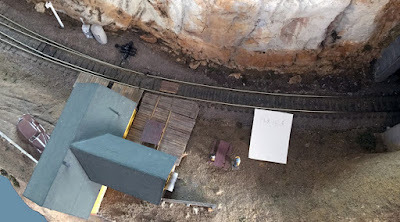 As you see above, I started out to use the full-cross-section Model Hobbies ties that I showed in my post about modeling tie piles (it can be found at: https://modelingthesp.blogspot.com/2018/12/tie-piles-and-rail-racks-modeling.html ). But I quickly realized that this will only work for my mainline track, which is up on more of an embankment and has higher rail. My branchline track is not only Code 70 rail but is much closer to ground level, and full-height ties would be too tall. For those situations, I would need a thinner strip to represent ties. I will try using some styrene 4 x 8 scale inches strip, or maybe even 2 x 8. This would give a lower profile (it is all ballasted around the “ties” anyway). I will come back to my “low profile” track car turnout panels in a subsequent post, along with installing these panels on the layout.